The orange one is from a pattern called Lil Dollop Pumpkins. It is free here. It is by Maria’s Blue Crayon. I used some old orange yarn I had that wasn’t very pliable. I also ran out of it so I finished with a different shade. I made the medium size. It is worked in a rectangle and then the ends are sewn together. I like the texture of it and will make more with a softer yarn. The two small pumpkins are crocheted but they are done to make them look knit. They are made with slip stitches. Even though they are small, they take some time since using the slip stitch doesn’t build the pattern very fast. The pattern is also free here. The pattern is by Malloo knits. The last one is called Spiral Pumpkin. It is free here. It is designed by Nicki’s Homemade Crafts. She used the new Caron X Pantone yarn by Yarnspirations. The yarn comes in a skein with 5 different colors looped togehter (they are separate mini skeins). Each set is $8 so a little spendy. I bought mine with a 50% off coupon at Michael’s. The yarn is amazing. It is so soft and nice to work with. I ended up running short of my cream otherwise the pattern worked up great. There are lots of color combinations that would be fun to do. I love pumpkins but the patterns can be tedious. I recently tried three new ones and enjoyed two of them. The rustic pumpkin is the brown one and the orange one in the other photo. These worked up quickly with bulky yarn. It was made with the inside of the pumpkin used for the outside and done in the back loops to help give it a bumpy look. The pattern is here by Meg Made With Love. The tall orange pumpkin with ridges is also by Meg Made With Love. I didn’t like it as well as it didn’t form like a pumpkin as well as I would like. The pattern is here. 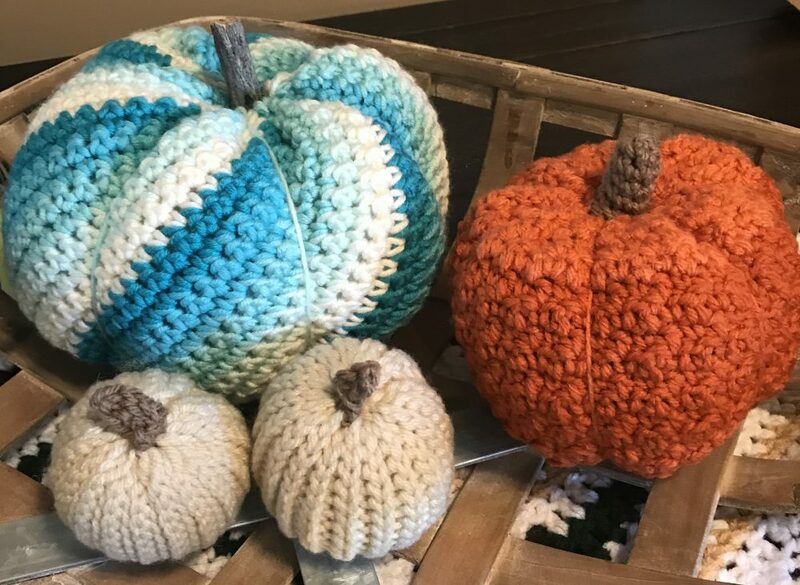 The blue pumpkin is a pattern from Yarnspirations. I liked it because it is formed with sc’s and dc’s. There is no need for you to do any shaping. The placement of the sc’s and dc’s makes the pumpkin shape. I made it blue as I liked the ones that Yarnspirations showed on their pattern. You can get that pattern here. The pattern has three sizes of pumpkins. I made the small size. I love to crochet and spend most of my free time doing it. I have two helpers you see in my picture, Jet and Suzy.